What are your top performing Tweets? What time of day do your Instagram posts get the most engagement? Is your Facebook marketing strategy translating to traffic and leads? If you’re not using social media analytics tools, you’ll probably have a hard time answering these questions. By now, most marketers understand the need for tools to measure their efforts. But as social media marketing has grown, the number of tools available to analyze your efforts has skyrocketed. At one point, you could probably name all the major social media analytics tools out there. Fast forward to today, and it seems like there’s a new tool released every day. Obviously, we couldn’t put together a list of the best social media analytics tools without mentioning our own. Every brand should have a dedicated social media management tool. With Sprout’s social media analytics, you can measure performance across Facebook, Twitter, Instagram and LinkedIn, all within a single platform. Having all of your analytics in one place makes it easier to track and compare your efforts across multiple profiles and platforms. Recommended for: Any brand that manages multiple social media profiles across multiple networks. If your brand is active on social media, a tool like Sprout is a must-have. Of all the major social networks, Snapchat gives brands the least amount of data on performance. One reason for this is the platform itself isn’t as robust as Facebook, Twitter and others. Aside from viewing and leaving comments, there isn’t a lot of data to be collected. But luckily, there are third-party tools you can use to get more in-depth Snapchat analytics. The most popular of which is Snaplytics. Snaplytics gives you data on the performance of your snaps, audience growth and more. Another unique feature of Snaplytics is that it also gives you insights on your Instagram Stories as well. Recommended for: Brands that want to measure their Snapchat performance. Delmondo: Delmondo is a social video analytics tool that provides performance data on your snaps, campaign reports and even lets you measure your Snapchat content against other channels. Storyheap: Storyheap is a newer social media analytics tool that provides Snapchat and Instagram Story analytics, as well as the ability to upload stories. Iconosquare is a social media analytics tool specifically for Instagram. One of the standout features that separates Iconosquare from other tools is that in addition to analysis of your normal photos and videos. It also gives you insights into Instagram stories. With higher level plans, you can also get influencer analytics as well. Recommended for: Brands heavily invested into Instagram marketing. Later: Later is another tool that focuses specifically on Instagram. In addition to publishing and organizing your feed, Later also provides analytics on your followers, engagement and more. Instagram Insights: If you want a free analytics tool for Instagram, the app’s native analytics for businesses is a good start. You can see your top posts, optimal posting times, audience demographics and more. 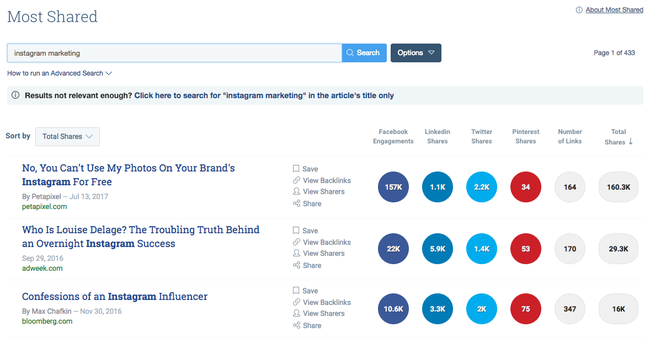 Buzzsumo is different than the other social media analytics tools on our list. Instead of analyzing your brand’s individual social media performance, Buzzsumo looks at how content from your website performs on social media. For instance, if you want to see how many shares your latest blog post received on Facebook and Twitter, Buzzsumo can provide you with that data. Social media is one of the top ways content gets spread. So it’s important to understand what resonates the most with your audience. Buzzsumo will not only show you the number of shares for each piece of content, but it also shows you which type of content performs best on each network based on length, type, publish date and more. Recommended for: Brands that that blog and distribute their content on social media. Epicbeat: Epicbeat is a content discovery tool from Epictions. You can use it to discover content trends, find top performing content and more. Ahrefs: Ahrefs is technically an SEO tool, but one feature they’ve added is their content explorer. You can enter a keyword and Ahrefs will show you the most shared content on that topic. While not as robust as Buzzsumo, it’s a good option when paired with the rest of Ahref’s analytics. While Instagram and Snapchat are currently the most talked about players in the visual social media landscape, Pinterest is still very active. And just like with any other social network, you need to measure your performance. Tailwind is arguably the most popular third-party Pinterest analytics tool. Through Tailwind, you can track trends in followers and engagement, analyze your audience and they even provide some Instagram analytics as well at certain plan levels. Recommended for: Brands that use Pinterest as one of their top marketing channels. Pinterest Analytics: If you currently don’t use anything to measure your Pinterest efforts, this is a good place to start. If Pinterest’s native reporting doesn’t provide you with enough data or you want more, then explore other paid options. Viralwoot: Viralwoot is a complete Pinterest marketing tool. You can see how influential your pins are, data on your boards (including group boards) and more. While it’s not technically a “social media analytics tool,” Google Analytics (GA) is one of the best ways to track social media campaigns and even help you measure social ROI. 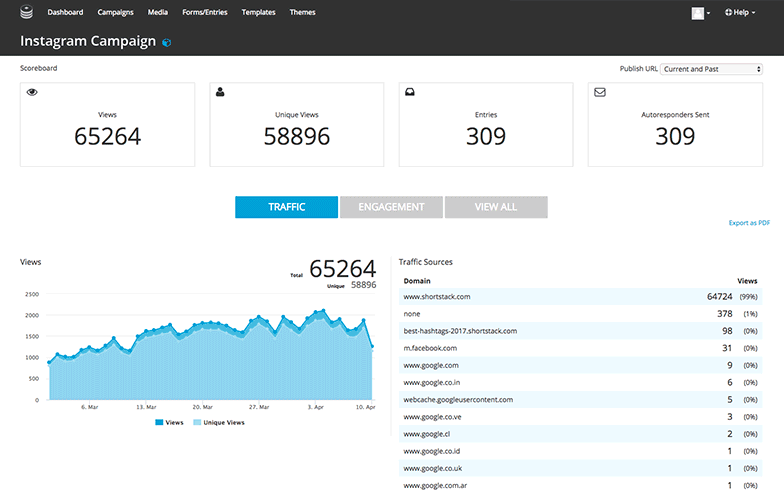 You likely already have GA setup on your website to monitor and analyze your traffic. 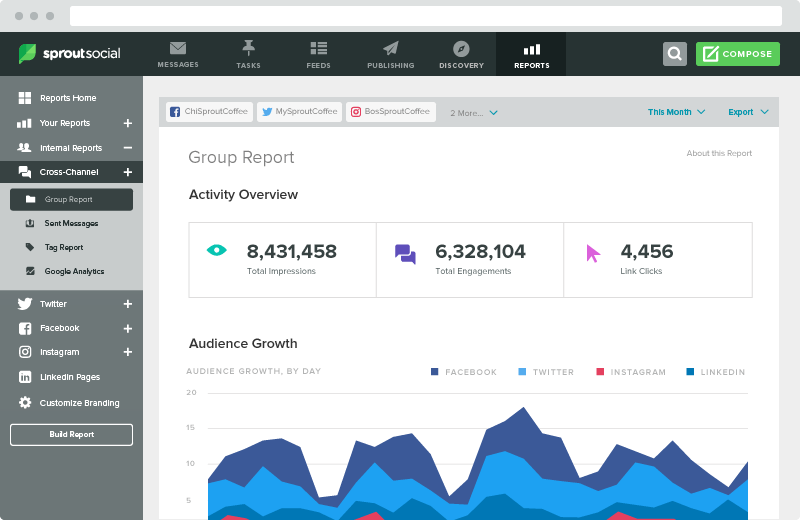 But did you know you can access and create reports specifically for social media tracking? For instance, you can see how much traffic comes to your website from each social network, or use UTM parameters to track specific social media campaigns. Recommended for: Any brand with a website. 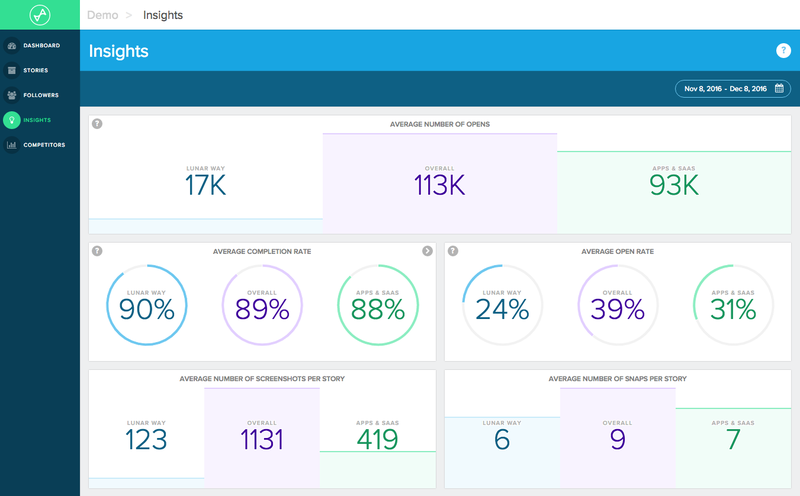 Adobe analytics: Adobe analytics is an enterprise solution, primarily for brands that need advanced segmentation and very specific sets of data. StatCounter: StatCounter is on the other end of the spectrum. It’s a very simplified website analytics tool that’ll show you information on your traffic including basic info on social media traffic. Have you ever run a social media contest before? Did you stop at picking a winner, or did you take the time to analyze how the contest went? ShortStack is a social media contest app that also provides performance analytics. Social media contests can be great for growing your following quickly, but if you’re not careful you could wind up just giving away free stuff with nothing to show for it. By analyzing your contest’s performance with a tool like ShortStack, you’ll be able to see engagement metrics and identify which types of contests work best with your audience. Recommended for: Brands that regularly run social media contests. Gleam: Gleam is a social media campaign platform. It allows you to do lead generation, run campaigns and analyze all your efforts. Woobox: Woobox allows you to run a variety of types of social media contests, giveaways, coupons and more. With influencer marketing becoming one of the most commonly used social media tactics, there’s a growing needs for analytics tool to measure your efforts. 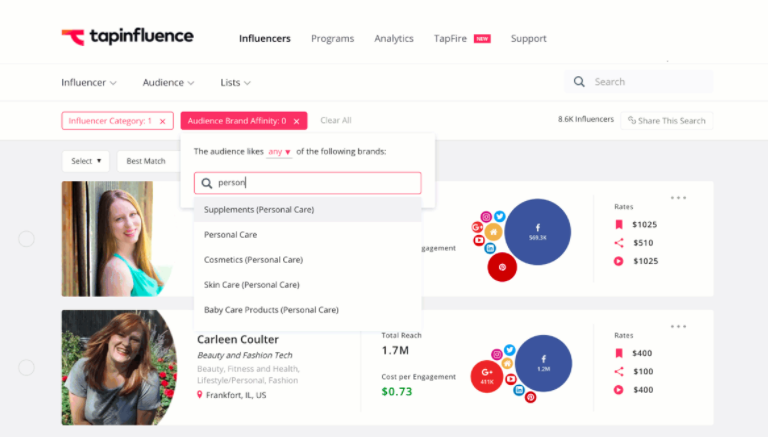 TapInfluence is a complete influencer marketing platform that research potential influencers you want to work with, as well as track campaign performance. For brands that only work with influencers every now and then, a tool this robust might not be necessary. But if influencer marketing is a key part of your social media marketing strategy, then you need a dedicated tool to manage and analyze your campaigns. Traackr: Traackr is an influencer marketing platform that allows you to manage everything from the influencers you work with to the specific campaigns you’re working on. Its analytics allow you to benchmark your efforts and track all your initiatives. Influencity: Influencity allows you to measure your influencer marketing efforts in real time. The good thing about Influencity is it puts a focus on measuring the success of your influencer marketing campaigns by setting your main KPIs such as engagement, reach interactions and more. What’s Your Favorite Social Media Analytics Tool? Like we mentioned earlier, there are several social media analytics tools out there. Our list just scratches the surface. What are some of your favorite social media analytics tools that make reporting and analyzing data easier?